International Journal of Research in Health Sciences,2017,5,3,28-31. 1Assistant Professor, 2Associate Professor, 3Post-Graduate Trainee and 4Prof. & HOD, Department of Pathology, Silchar Medical College, Assam, INDIA. Introduction: Ectopic complete molar pregnancy in the ovary is an exceptionally rare event. We report a case of ovarian hyaditidiform mole occurring in a 30 years old female with ovarian endometriosis. Case history- A 30 years female presented with complaints of 4 weeks amenorrhea along with nausea, vomiting, lower abdominal pain, lower backache, irregular vaginal bleeding. Per vaginal examination revealed a tender right adnexal mass. On ultrasonography, thin walled anechoic cyst was seen in right adnexa measuring 9.2×9 cms. Patient underwent myomectomy with right sided cystectomy. 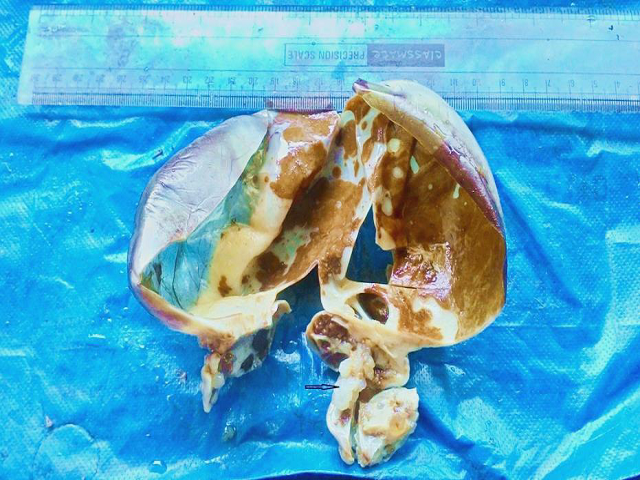 On gross examination, a large cyst measuring 13×8×5cms with cut surface showing thick brownish material was seen attached to right ovary along with cluster of grape like cystic structures. H & E stained sections showed endometrial glands with endometrial stroma dispersed among the ovarian stroma consistent with endometriosis. Section from the cystic structures showed hydropic degeneration of the villi and trophoblastic proliferation showing features of hyaditidiform mole. Conclusion: While ultrasonography might not be able to fully diagnose ectopic molar pregnancies, histopathological examination of the conception products is the current gold standard for the diagnosis. However, strict criteria must be applied to prevent over diagnosis of molar pregnancies in cases of ectopic gestation. showing gross picture of ovary with hydatidiform mole (see arrow).